The murder of Michael Brown in Ferguson by a white police office is a miscarriage of justice and sets the country back forty years. It says to me, that my life as a black man in America and the lives of my children are not valuable. It also says to me that a white officer can shoot me or any one who looks like me if he only says he was in fear for his life – even if the facts and eyewitness accounts contradict that. In Ferguson, I was hopeful that the grand jury would do something- even if only a small reprimand – to send a message to police officers around the country, that it is not okay to shoot an unarmed man 35 feet away from you with his hands in the air and ready to surrender. But this did not happen. And while many in the nation (like myself) were grieving over this miscarriage of justice another grand jury in New York refused to find any wrong doing in the choking of a black grandfather who was accused of selling cigarettes but was not a threat to anyone. Those two decisions made me feel as if someone punched me in the stomach and knocked all the wind out of my body. I am still grasping for air and I am still shocked and saddened. 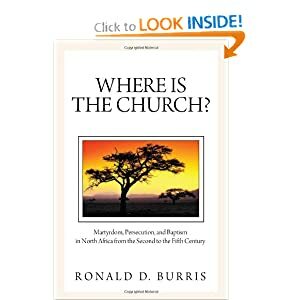 My concern is this: if there is never any police sergeant on the scene to tell misbehaving officers to stop using excessive force; and then the justice system does not step up to the plate and say this wrong and you will be punished, then how can any black man in America feel that he will receive fair treatment on the streets or in a court of law? It now seems obvious, that there are two justice systems in America, one for white people and one that denies black persons due process. There is one thing, however, that gives me a reason to be hopeful. Many protesters throughout the nation were also white men and women (and other races as well) saying that this is wrong. If enough Americans can continue this protest and insist that these killings stop and everyone be treated fairly, then perhaps one day we can have a country that protects all its citizens. 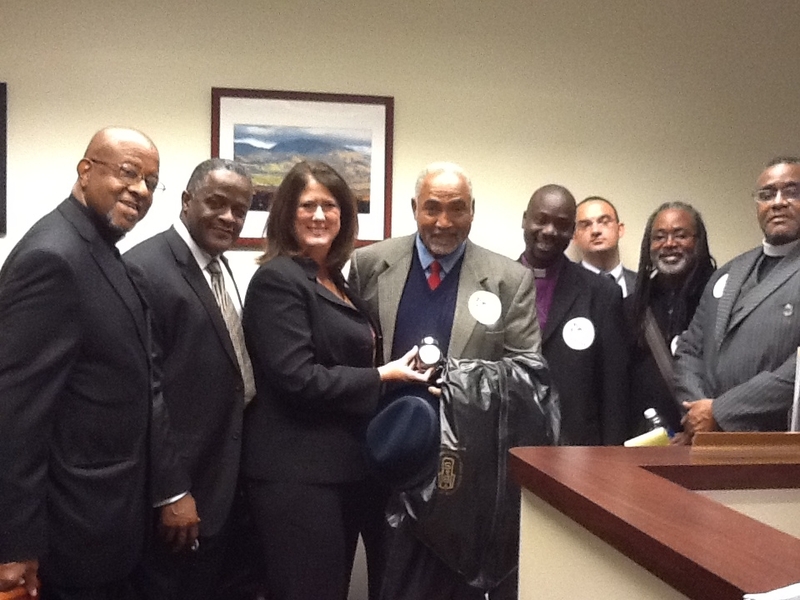 ABSW’s Associate Professor of Church History, Dr. Ronald Burris, and other clergy from Contra Costa County met with Assembly Woman Susan A. Bonilla to demonstrate the importance of faith in the community. 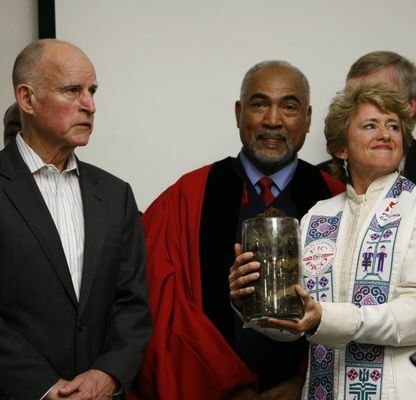 Here, Dr. Burris presents the Assembly Woman with some soil from Contra Costa County, representing the people of Contra Costa County, and the need for California to be a land of opportunity for all people. Dr. Burris also met with Governor Jerry Brown regarding the “Land of Opportunity Initiative”, and the role of faith-based organizations in California’s future. (Above) Dr. Burris adds soil, representing the people of Contra Costa County, to the soil contributed by other clergy from California. Governor Jerry Brown looks on. 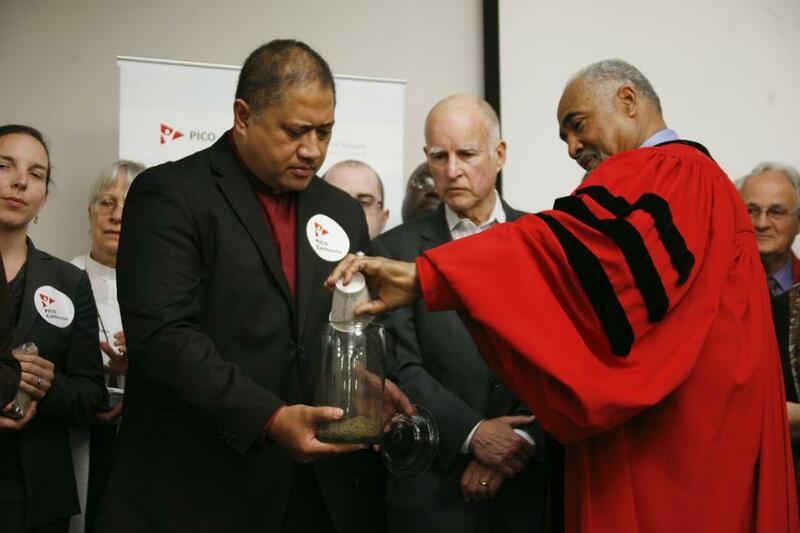 The soil was then presented to the governor by Dr. Burris and California clergy to symbolize the efforts of PICO, and to encourage the state government toward creating opportunity for all people in California. In book one of Augustine’s Confessions, he begins by praising God and at the same time confessing what he has come to learn about God. And what he has come to learn is that a lost soul is still a part of God’s creation. Moreover, a lost soul desires to praise God-even though it may not know it at the time because it is wrought with sin and pride. Augustine would insist however, that this loss soul is restless until it finds rest in God. But he also realizes that God is the one drawing this lost soul to Himself. But this is not of our own accord, but God arouses us to praise Him so that it may bring us joy. In fact our hearts are restless until they find rest in God. After Augustine recognizes that God is the one drawing us to Himself and that He is worthy of praise, he begins to ask a few questions. Surely, Augustine is reflecting upon his life here and how he followed the wrong path when he thought it was the right path. Something we all can relate too. Augustine cannot answer each of his questions, but he does find one answer that seems to satisfy his hunger. So he tells his readers as he confesses the truth of what he has discovered. Augustine realizes that praise is comely for the upright and he is ready and willing to offer up this praise for he has found the Lord.